Disclosure: I got this product as part of an advertorial. The bitter winter cold is taking a toll on everyone. The frigid weather and dry air is causing havoc on our skin. A good moisturizer is key to protecting my skin. Habe Naturals offers a 100% natural hand, foot, and body cream. This pure and simple body cream is made from olive oil, beeswax, coconut oil and tea tree oil is creamy yet not greasy. During winter, my hands suffer from lack of moisture. From the cold weather to washing dishes, my hands are a wreck. I have been using the Habe Naturals when I go to bed at night. A liberal amount over my hands and even cuticles makes them super soft. More importantly, my hands look youthful, not old and wrinkly. Plus, the scent is subtle and doesn't bother me while I sleep. 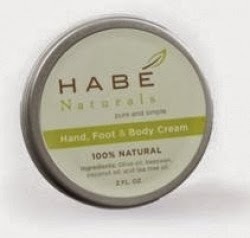 Habe Naturals Hand, Foot and Body Cream can be purchased at the Habe Naturals website for $12.73 with free shipping. Would you like to try this item for yourself? Please use the Rafflecopter to enter. Thanks for the giveaway and information! I always have really dry skin this time of year. I would love to win this.